Shop Custom Logo Golf Towels with your logo. 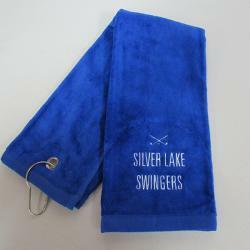 Put your company logo on our wide selection of towels for your next golf tournament, event, outing or promotion. 4. Your golf towels will be produced and shipped followed by a tracking number sent by email. Custom Logo Jersey Shaped Golf Towel. Boost your brand in brilliant color with FOTO Vision! Strikingly clear full color graphics. Edge to edge sublimation - your artwork will be showcased to the full size of the towel. Soft to touch, photo realistic image.. Custom Logo Stick-It Magnetic Golf Towel. When you throw in the towel, just pick it up. The Monument Golf Stick It Magnetic Towel gives players ultimate convenience when using a golf towel throughout the round. Designed with a removable industrial-st.. Custom Logo Velour Silkscreen Golf Towel. The 1518HC is made of 100% cotton velour with hemmed edges and comes 5 standard colors. In addition, this towel can be imprinted in a portrait or landscape orientation using up to 4 colors. With the an 11 inc.. The Links Golf Towel Printed with your Logo. Your next event will be above "par" when you feature The Links golf towel! This 16"L x 24"W hand-sized towel is made with two-ply dobby hemmed velour for a silky soft dry with every use. Customize this wit.. Custom Discount Image Dyed Putter Towel with Your Logo. Putter clip allows the towel to be attached to the putter's shaft, therefore, the player will always have his towel on the way to the green. It is deal for your multi-colored logo. Make great gi.. Custom Image Dyed Golf Towels. Large pro-size golf towel for the event with your best golfers. Features the best jacquard weaving with the rich look of image dyeing. This combination presents the most vibrant look for your logo while delivering a sof.. Custom Logo Aqua Cool Towel w/ Storage Tube. Wet It! Wear It! Stay Cool Anywhere. Cooling towel stays 15 to 20 degrees cooler then the air. This towel is good for 5K runs, Relay for life, golf outings, construction companies, utility workers, sportin.. Custom Logo Chilly Pad Golf Towel. The Frogg Toggs Chilly Pad towel keeps you cool on the golf course, during a workout, hard ride or tough climb. When wet, the towel becomes considerably cooler than the outside air, providing cooling relief to the user.A.. Custom Logo Combed Velour Golf Towel. For the best response from clients, give out this golf towel at the next tournament or at a country club! It's made in the USA, measures 16" x 24", and is constructed of ring spun combed velour with a dobby hem and 10..